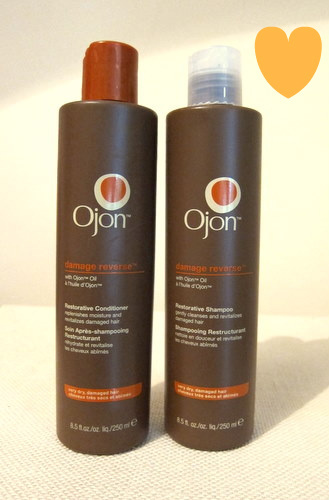 Cult haircare favourites Ojon launched in Arnotts this month. There are five available ranges: Damage Reverse, Dry Recovery, Volume Advance, Color Sustain and Full Detox. Celebrity fans apparently include Alicia Keys, Gisele Bunchen and Scarlett Johanson, so I was delighted to be offered the chance to try them out. As regular readers will know, my hair is a little unhappy right now so I chose the shampoo and conditioner from the Damage Reverse line. The star ingredient in both is the eponymous ojon oil, a form of palm oil, derived from the nuts of the Ojon palm tree in the rainforests of Central America. The oil is rich in essential lipids -- similar to those found naturally in healthy hair -- and harvested by the native Miskito people in the same way they have for more than 500 years. The company does a lot of good work with the indigenous community to produce the oil while sustaining their natural environment. The products come in identical brown bottles but with different coloured caps so you can tell them apart in the shower. It’s the little things, people! I’ve heard mixed reports about the scent -- Tonka Bean, Vetiver, and Benjoin, apparently -- but the products smell wonderful to me: warm and exotic and almost chocolatey. The shampoo is a pearlescent white which lathers up nicely and cleanses without stripping my hair. The conditioner is rich and creamy, almost buttery, and after using it my hair feels instantly smoother and tangle free. After the first use, I let my hair air-dry, and apply a tiny amount of Shu Uemura hair oil as usual. By the time I get to work my hair is dry and the results are obvious. I am transfixed by my shiny, healthy looking hair in the lift mirror. I can’t stop touching it. And my waves look awesome. My fellow lift-travellers no doubt think me incredibly vain. I’m hesitant to say this after just one week’s use but so far, I’d rank these amongst the best hair products I’ve tried to date. I haven’t been this impressed since that fabulous Schwarzkopf shampoo and conditioner I wrote about here. But Ojon certainly gives them a run for their money. At €24 for the shampoo and €26 for the conditioner, there’s no doubt that these products are on the more expensive end of the haircare scale. And are they worth it? It all depends on your hair type. If you’re blessed with naturally soft, shiny, healthy looking locks then no, you probably don’t need to be splashing out on this stuff. But if, like me, your hair is dry and damaged and you want to see rapid improvements, then yes, in my opinion, it certainly is. Ojon is available from Arnotts Dublin. The Damage Reverse range also contains a Restorative Hair Treatment (€39.00), Finishing Spray (€29.00) and Smoothing Glaze (€35.50). So many oil based products now it's hard to know what to choose! How does this compare to Moroccan Oil shampoo and conditioner do you know? Thanks Roxy - I've tried Moroccan oil but not the shampoo or conditioner so I can't compare I'm afraid. But thumbs up from me on the Ojon products! Sounds great, will keep them in mind for when I need new shampoo & conditioner. I've two of each on the go at the minute. Thanks Paula - what are you using at the mo? oh sweet JESUS! needing these big time! would they be OK for fine hair would you think?